At work, I make the homemade macaroni and cheese us Southerners have been eating all our lives. Rich, bubbly, creamy, cheesy.. the way your grandmother made it. Sometimes I use elbow macaroni for the authentic look but sometimes I use whatever pasta is on hand and really, any pasta will do. A couple of weeks back I was in a better, non-hurried mood at work and I made some “mac & cheese” a little different than usual. It turned out to be a hit with AT&T employees. 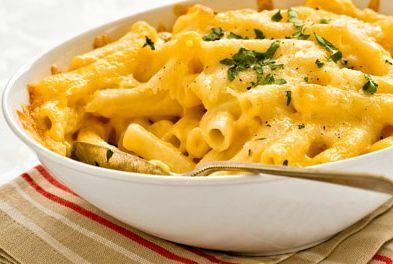 I had tons of positive feedback that week about that mac & cheese, so when I asked my customers recently if there were any recipes they would like to see on the blog, I wasn’t surprised when 7 people emailed back asking for my recipe for THAT mac & cheese. For that batch, I used penne instead of macaroni, but like I said, you can use whatever you have on hand. Cook pasta in boiling, salted water until al dente. Drain and put in a large mixing bowl. In a medium saucepan, melt the butter over low heat until frothy. Add flour and cook, stirring continuously and cook for 3 minutes. Add milk, half & half, bay leaves and salt. Increase the heat to medium high and bring to a simmer, stirring occasionally to ensure you’re not scorching on the bottom of the pan. Cook until the sauce has thickened enough to coat the back of a spoon (if you want to speak the lingo, that’s called nappe in cooking terms), about 10 minutes. Add half the cheddar cheese and stir until completely melted. Remove from the heat and season with the pepper (and a little more salt if you’re a salt lover like me). **This is the same way to make cheese sauce for cauliflower au gratin, or homemade au gratin potatoes**. Pour the cheese sauce over the pasta and stir thoroughly to mix. In a greased 3 quart casserole dish, spread half the pasta (about 4 cups). Top with half the remaining cheddar cheese, then top with half the Swiss cheese slices. Repeat with another layer of pasta but this time top with the Swiss cheese and finish with the remaining cheddar cheese. Bake in the middle rack of the oven for about 30 minutes, until bubbly and slightly browned on top. Serves up to 12 people depending on how hungry they are. This entry was posted in Starch Side and tagged homemade mac & cheese, macaroni cheese, penne cheese by quarlj01. Bookmark the permalink.